This is simplest and most widely used model in the software development process. 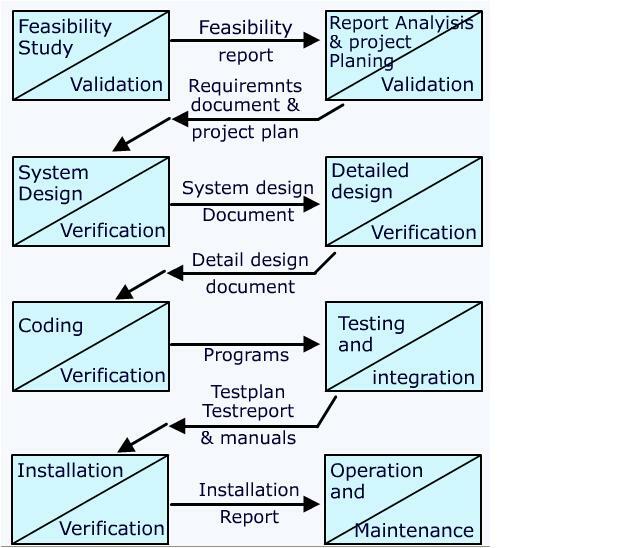 The sequence of activities involved are feasibility analysis, requirement analysis and project planning, system design, detailed design, coding and unit testing, system integration and testing At the end of each phase, validation and some certification of the intermediate, work product is made to ensure that the output of a phase is consistent with its input, and the output of a phase is consistent with the overall requirement of the system. It is suited for routine type of projects where all the requirements are well understood. Suitable to automate the existing manual system where requirement is completely known.